Help Me Understand is based on the underlying (and accurate) assumption is that employees come to meetings with widely different questions around a topic or a change.It assumes leadership can anticipate some questions and concerns but can’t possibly anticipate them all. No one knows the questions employees have better than the employees themselves, so this game gives them a chance to externalize what’s on their minds and have leadership be responsive in a setting outside the once-a-year leadership retreat. It also allows the players to discover overlaps with other players’ questions and to notice the frequency with which those questions occur—something they may not have known prior to the meeting. It lets some sunshine in around a project, initiative, or change so that employees—who have to implement that change—have fewer lingering questions. 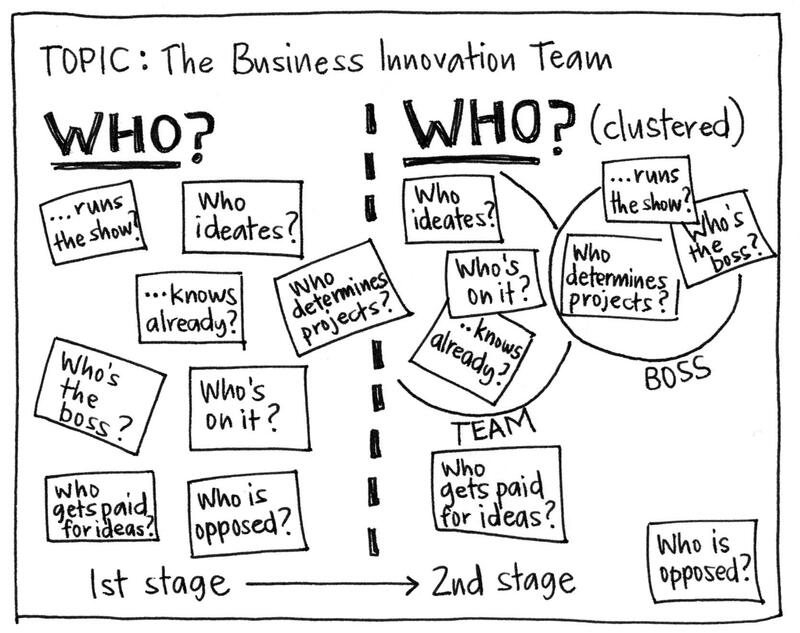 In a large white space visible to all the players, write the topic of the meeting and the following words as headers across the top: “WHO?”, “WHAT?”, “WHEN?”,“WHERE?”, and “HOW?”. Give all players access to sticky notes and markers. Tell the players that the goal of the game is to help leadership understand and be responsive to any and all questions around the topic. Start with the question “WHO?” and give the players five minutes to silently write down as many questions as they can that begin with the word WHO. Ask the players to post all of their questions in the white space under WHO? and then ask for a couple of volunteers to cluster the questions according to topical similarity. Bring the largest clusters to the group’s attention—circle them if you prefer—and ask leadership to offer a response to the most common questions in the clusters and to any outlier questions that look interesting. Repeat this process for the remaining four header questions, each time asking leadership to respond to the questions that seem the most salient to the group. When the meeting closes, gather all of the questions so that leadership has the opportunity to review them later and respond to important questions that weren’t covered during the meeting. As the group leader, you can conduct this game in different ways. One way is to ask the five questions back to back, with the players creating sticky notes for all five questions—WHO?, WHAT?, WHEN?, WHERE?, and HOW?—and then posting and clustering them during the first half of the meeting. After they’ve completed that part of the game, the players ask leadership to address the major clusters during the second half of the meeting. Another approach is to let leadership intersperse responses while the players tackle the header questions one at a time. There are benefits to both approaches. The first approach allows the players to write questions uninterrupted by content from and reactions to leadership. It also allows leadership to save some time since they only technically need to attend the second half of the session. The second approach breaks up the flow a bit but will inevitably affect the types of questions the players ask since they’re getting information from leadership as they go. Choose what’s appropriate based on your knowledge of the group. During the clustering part of the game, you may want to write emergent themes near each cluster to give leadership summaries of where their employees’ attention is. This is also helpful for the players to reinforce that they have shared concerns. The themes should be one- to three-word phrases summarizing the general content of the clusters. And as the meeting leader, encourage employees to make the most of this game since it presents an unusual opportunity for them to pose real, substantive questions directly to their company leaders. This game is an adaptation of WHO WHAT WHEN WHERE and HOW from The Facilitator’s Guide to Participatory Decision Making by Sam Kaner. In his book, Kamen notes that his use of this tool was inspired by an exercise called “Five W’s and H” in Techniques of Structured Problem Solving, Second Edition, by A. B. Van Gundy, Jr., p. 46. The goal of this game is to map out the motivations and interactions among actors in a system. The actors in this case may be as small-scale as individuals who need to work together to accomplish a task, or as large-scale as organizations brought together for a long-term purpose. 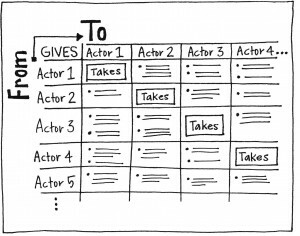 A give-and-take matrix is a useful diagnostic tool, and helps players explore how value flows through the group. To begin, you will need a list of all the actors in the system. This may be prepared in advance or generated at the start of the exercise. Using the list, create a matrix with the list of actors along both the horizontal and vertical axes. Primary motivations: For each actor in the matrix, fill in “what they want” out of the system. This information goes along the diagonal, where the individual actors intersect with themselves. These should be brief phrases that describe a goal or reason the actor participates in the system. For some intersection points, this will be easier to describe. In other cases, the matrix will expose previously unconnected actors and possibly those at odds with each other. The goal in completing the matrix is to find the most complete picture of how each actor can benefit all the others. Completing this matrix may involve research both before and after the initial mapping process. By using surveys or interviews, players may be able to explore and validate both the initial inputs and the intersecting interests. 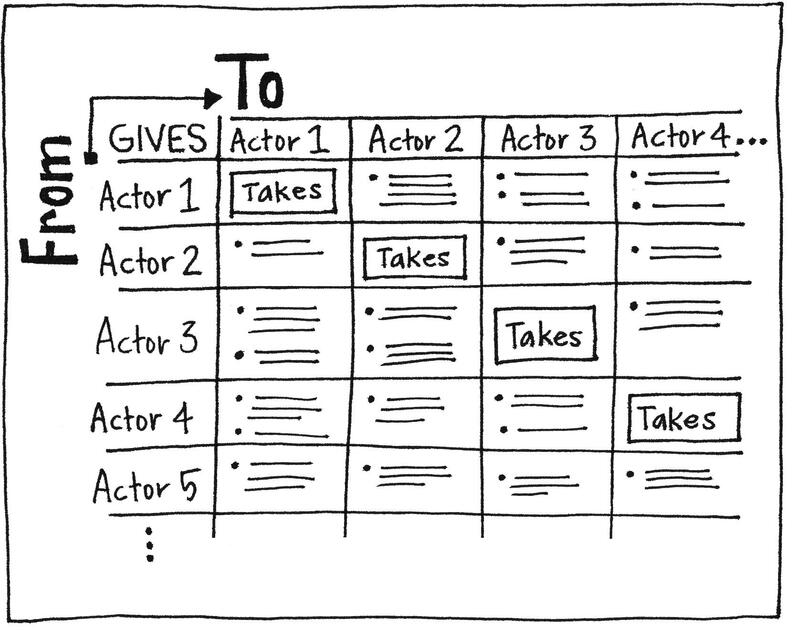 Along with stakeholder analysis and boundary mapping, the Give-and-Take Matrix helps players explore and define the actors and interactions within a system. The Give-and-Take Matrix is inspired by a number of techniques used in engineering, chemistry,and design. 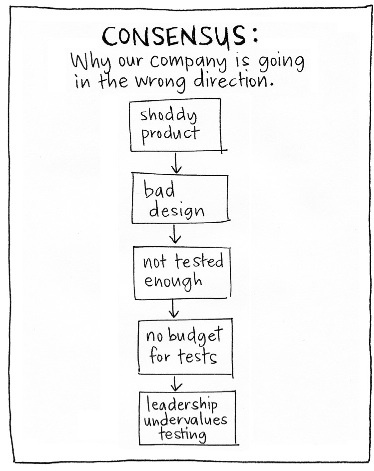 Every human being has blind spots and every company does, too. Knowledge openness can enhance businesses and relationships while knowledge blindness can make things unnecessarily more difficult. In other words, what we don’t know can hurt us. The military refers to this as “the fog of war.” The premise of this game, therefore, is to disclose and discover unknown information that can impact organizational and group success in any area of the company—management, planning, team performance, and so forth. Before the meeting, decide on a topic for discussion. Draw a large-scale profile of a person and draw four arrows coming out of the top of the head. 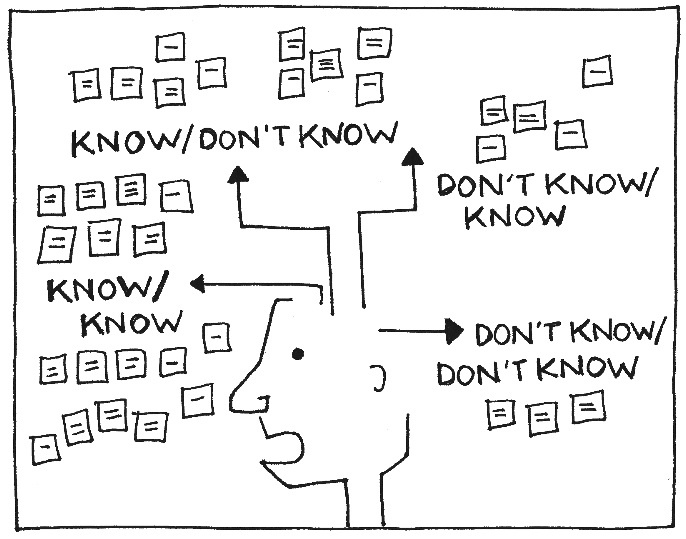 Label those arrows “Know/Know”, “Know/Don’t Know”, “Don’t Know/Know”, and “Don’t Know/Don’t Know”. Give the players access to sticky notes and markers and tell them that the purpose of this game is to try to make explicit the knowledge they have, and the knowledge they don’t have but could use. Next, tackle Know/Don’t Know. This category will go less quickly than the first but should still generate plenty of content. Again, ask them to cluster the sticky notes near the related arrow. 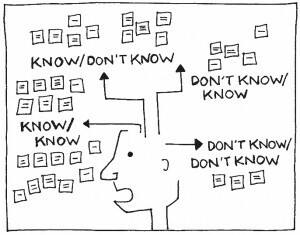 Move to Don’t Know/Know. This information could be skills people have that are currently not used to solve problems or untapped resources that have been forgotten. Last, move to Don’t Know/Don’t Know. The group will be stopped here, possibly indefinitely. This category is where discovery and shared exploration take place. Ask the players provocative questions: What does this team know that your team doesn’t know it doesn’t know? How can you find out what you don’t know you don’t know? Ask the group what they can do to proactively address the distinct challenges of each category. Discuss insights and “aha’s”. Even if the players’ only revelation is that they have blind spots, this in itself can be a fruitful discovery. This game works best with a familiar team when the participants cross disciplines and responsibilities. Having a diverse group enhances the feedback loop for the Don’t Know categories, which are where the players are going to get stuck. They’ll be confident about what they know—and even about what they know they don’t know—but without an outside perspective, it’s next to impossible to declare what we don’t know we don’t know. 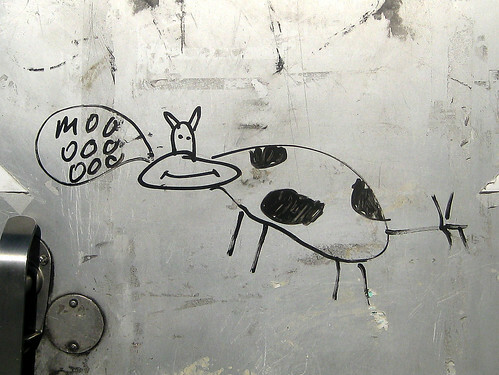 The nature of this question warrants discussion and the solicitation of others’ observations. Because this game has an obvious trust-building component, start by sharing easy information and move toward more substantive information depending on the players’ comfort level. 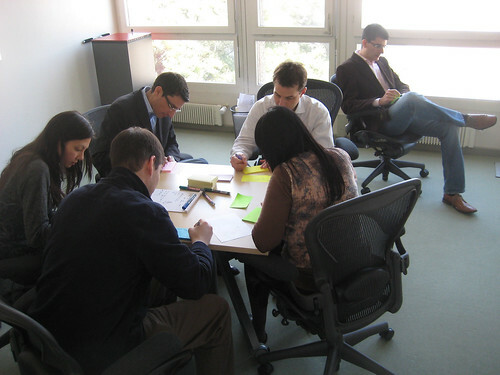 Keep the group on business- or project-related topics and away from personal evaluations. Although The Blind Side can be used as a psychological assessment, the self-help applications of this game should be conducted outside the business setting, unless you’re dealing with the rare group that’s into that. The Blind Side is inspired by and adapted from the Johari Window, a communication model developed by Joseph Luft and Harry Ingham. There is a time to go deep. Just as in science, breaking large structures into their base components is fundamental to knowledge work. It is how we create understanding and formulate new ideas. 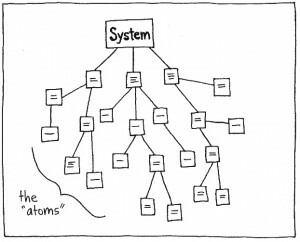 By breaking the larger system into its components, the group will have an advantage in problem solving or brainstorming. Because they are more discreet and tangible, the smaller components are more easily handled and better understood. Likewise, the overall map that is created will help serve as an explanation of the overall system. 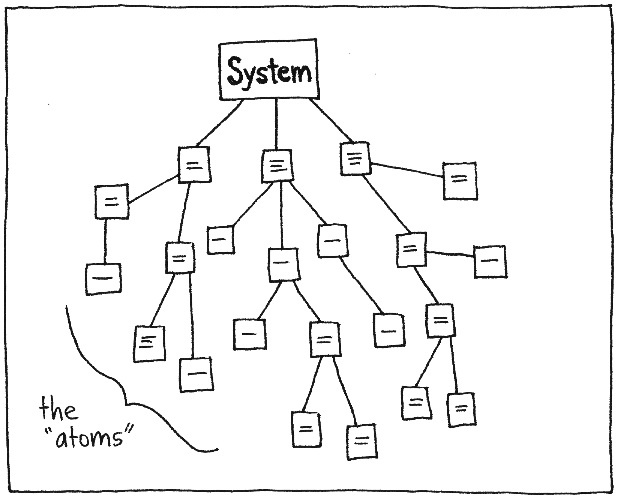 To start the brainstorming, ask the group to “split” the main system into its components. In this step you are generating a list of things to capture on sticky notes directly below the main topic. Generally, a short list of three to five large components is the norm. For each item, repeat the splitting process by asking “What combines to create this?” In this manner, you will build a pyramid of components all the way down. The map and individual components that result may be used as inputs into other activities, or may be documented as an explanation of a system’s parts. At some point, usually four to five levels deep, there is a natural turning point. Instead of becoming more diverse, the items start to become more fundamental. This is the atomic level, and where some of the most interesting results are found. In exploring a group’s culture, this is where hidden attitudes and behaviors unique to the group may be discovered. In atomizing a service offering or product, this is where elementary characteristics and differentiation points may live. The Atomize game is credited to James Macanufo. Many of the games in this book are about seeing the bigger picture or relating a problem to its context. 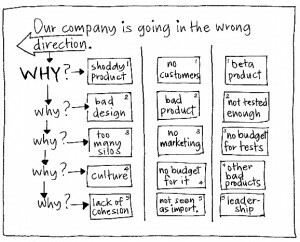 The 5 Whys game mirrors that motive to move beyond the surface of a problem and discover the root cause, because problems are tackled more sustainably when they’re addressed at the source. 1. 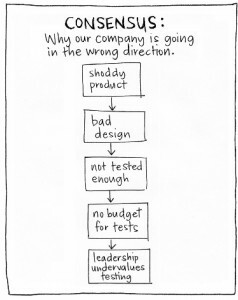 Prior to the meeting, establish a problem your team needs to evaluate. 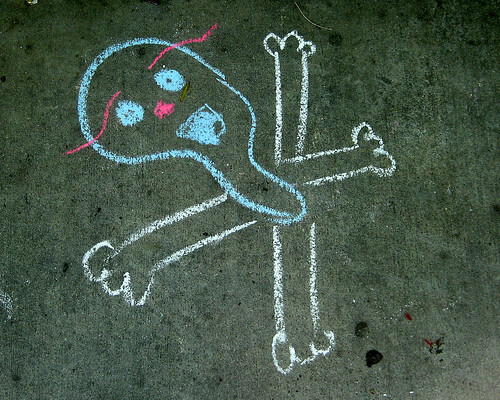 Write the problem in an area visible to all the group members, and if you’d like, draw something that represents it. 2. Distribute sticky notes to each player and ask them to number five of them 1 through 5. 3. Ask the players to review the problem statement and ask themselves WHY it’s a problem. Then ask them to write their first response on sticky note 1. 4. Tell the players to ask themselves WHY the answer on sticky note 1 is true and write their next response on sticky note 2. 5. Again, tell the players to ask themselves WHY the answer on sticky note 2 is true and write the response on sticky note 3. 6. Repeat this process in numerical order until every numbered sticky note has a response written on it. 7. 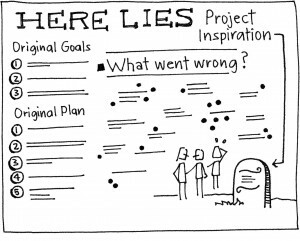 Below the problem statement, write the word “Why?” five times in a column and draw lines to create columns for each player’s set of notes. Ask the players to approach the wall and post their responses, starting with 1 at the top and ending with 5 on the bottom. 8. Review the “Why” columns with the group and note commonalities and differences. This game is about reading more between the lines—about understanding the root cause of a problem so that people can get the greatest leverage out of solving it. When leading this game, encourage the players to be honest. This is the single most important strategy. If the players avoid the issues, the game doesn’t yield good information. And in a worstcase scenario, you could have people actually addressing the wrong problems. 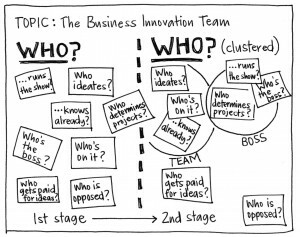 So, as the meeting leader, be aware of the dynamics between the players and foster open conversation around the difficult question of “why”. Another important practice is to ask the players to write the first thing that comes to mind each time they ask “Why?”. If they jump immediately to the perceived root of the problem, they may miss the opportunity to see the stages, which are valuable to know for problem solving at different levels. Finally, many problems require more or less interrogation to get to the root. 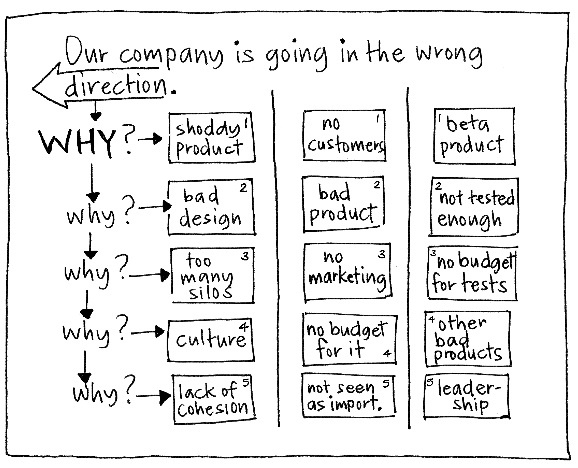 Ask “Why?” until you feel the group is really getting somewhere. 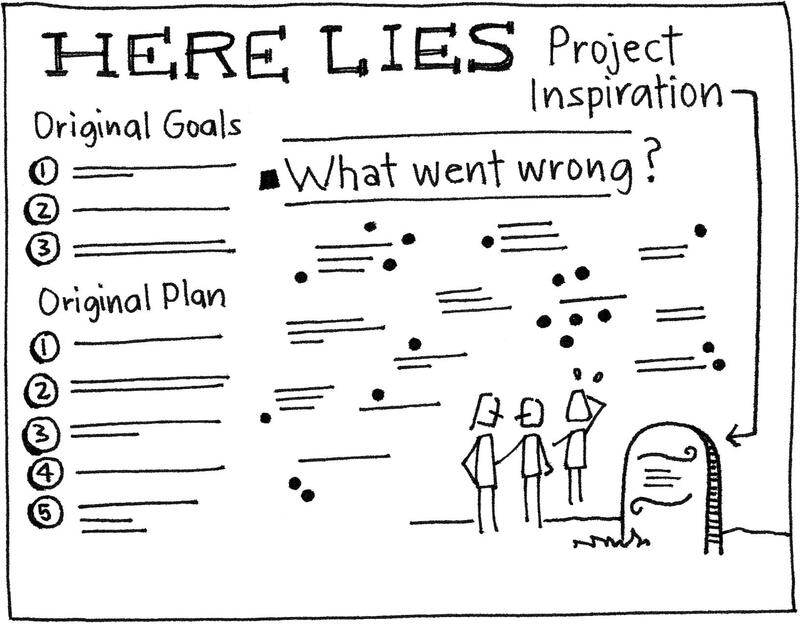 Five Whys is a healthy place to start, but don’t interpret it as a fixed number. Build longer WHY columns if necessary, and keep going until you get the players to meaningful insights. The 5 Whys game is based on a game by Sakichi Toyoda. When a problem is interesting and important, we naturally rise to the occasion. To set up the exercise, develop a question in advance that engages both the emotional and the rational parts of the brain. A mobile device without batteries would be an engineering feat (rational) and a make-the-world-better proposition (emotional). Write this question for the group and explain the challenge. • What new benefits or features might emerge from this constraint? • Why is this a typical constraint or requirement? Is it just a customary assumption? • What are the core elements in conflict? • Can the conflicting elements be eliminated, replaced, or altered in some way? • Is there anything that can happen before or after to change the parts in conflict? • Can time, space, materials, motion, or the environment have an effect? At the end of the 30 minutes, groups present their concepts to each other. 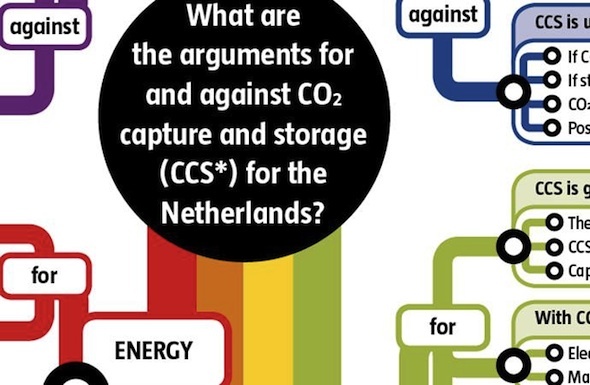 Following this, a reflective discussion about both common and uncommon approaches should yield a list of possible solutions to be explored further. Closing and next steps should include this follow-up work. This challenge works well for thinking through assumptions and obstacles in a product or a process. When a product is languishing and needs to be re imagined, this technique will help challenge basic assumptions about its design. In cases where processes are slow or overloaded, the “fire drill” question of “How would we do this in a day?” can be a powerful framing device. The Mission Impossible game is credited to James Macanufo. We understand things by grouping them with other things of similar type and function. An airplane is similar to a helicopter; they’re both flying things. Both are more similar to a bird, which is also a flying thing, than any of those things are to an earthworm, which is a crawling and tunneling thing. The Forced Analogy game breaks these hard-wired categories and allows us to see things from a different angle, opening new possibilities in problem solving and idea generation. • How is this problem similar to [random object]? • How would I solve this problem with [random object]? A truly random list of objects will push the boundaries of the group’s mindset and create new perspectives. If needed, this list can be created in advance of the game itself by an unbiased nonparticipant. The source of the Forced Analogy game is unknown.